WWF-UCO together with leading Civil Society Organizations under their umbrella Civil Society Coalition on Oil and Gas (CSCO) presented a number of issues during the public hearing for the Environmental and Social Impact Assessment (ESIA) report for the Tilenga Development Project. CSO leaders and community members from Bulisa and Nwoya raised concerns about the East African Crude Oil Pipeline during a public hearing organized by The National Environment Management Authority (NEMA) linked to the Environment and Social Impact Assessment (ESIA) Report for the Tilenga Oil Project. The hearings were held on November 5th and 8th 2018, in Bulisa and Nwoya districts respectively in conjunction with the Petroleum Authority of Uganda. Speaking on behalf of CSOs in the region, Onesmus Mugyenyi, Deputy Executive Director of Advocates Coalition for Development and Environment (ACODE) and Irene Ssekyaana, Chairperson of CSCO presented the key concerns about the East African Crude Oil Pipeline on during the public hearing. The issues raised were; Limited analysis of the Base-line environmental conditions, inadequate analysis of Trans-boundary issues, limited time given to the public to review the ESIA report , inadequate analysis on the implications of water abstraction from lake albert and abstraction of ground water in the already stressed area in Buliisa and the fact that the ESIA report did not underscore the challenge of proceeding with oil development decisions in absence of adequate legal framework and not making the finalization of the laws a condition precedent to the approval of the project. 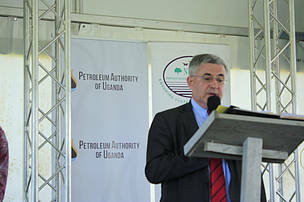 The Tilenga project refers to the development and production of oil fields within Murchison Falls National Park (MFNP) - North of the Victoria Nile in Nwoya District, and South of Victoria Nile in Buliisa District. The name Tilenga is derived from the two local names for the Uganda Kob (Antelope), which is called “Til” in Alur/ Acholi and “Engabi” in Lugungu. According to the report, the project will be in four phases from construction to the final decommissioning when the oil has stopped which is estimated to 25-30 years. The project comprises of six fields with 34 well pads where 400 oil wells will be drilled and will employ an estimated 6,600 workers. In 2016, the Government of Uganda granted Production Licenses to Total Exploration and Production Uganda B.V. (TEP Uganda) and Tullow Uganda Operations Pty Ltd (TUOP) to develop and operate upstream petroleum facilities in the Albertine Graben. TEP Uganda was granted Production Licenses for Ngiri, Jobi-Rii, Gunya fields while TUOP was granted Production Licenses in Mputa-Nzizi-Waraga, Kasemene-Wahrindi, Kigogole- Ngara, Nsoga and Ngege fields. In accordance with the National Environment Act Cap 153 and the National Environment (Environment Impact Assessment) Regulations, S.I No. 153-1, Total E&P Uganda and Tullow Uganda operations Pty Ltd prepared the ESIA for the proposed Tilenga project; following the discovery of the commercially viable oil deposits during the exploration phase; and submitted the report to NEMA for consideration. After the ESIA report was made public on the NEMA, Total, PAU websites and several libraries; the public was asked to review the document and the two public hearings were subsequently held, as part of the processes to ensure transparency in the approval process. During the first hearing held at Buliisa district headquarters; some members of the community argued that they were not consulted about timely compensation and feared they would lose their land to the project; and also questioned how communal land would be compensated. Mr. Dickens Kamugisha, the chief executive of the Africa Institute of Energy, reechoed the need for a law that ensures that the developer comes up with a resettlement plan for those that shall be required to vacate their land to pave way for the project. “Currently there is no law to guide the implementation plans. I recommend that after the necessary consultation with the communities, the resettlement plans need to be completed and approved,” he said. Mr. Enoch Bigirwa, the Bagungu Community Association Chairperson noted that the ESIA did not recognize the Bagungu as an indigenous tribe in the Albertine Graben; and suggested that the project be renamed to Bugungu – Tilenga Oil Project. In response to the concerns, Ms Marion Adengo, the head of social affairs Total E& P said most of concerns were covered in the ESIA report and urged the people to read the entire document. “For compensation delays, we have gone through a stage and we are trying to see how we can narrow it down. Plus there were some other good suggestions that have been put across here; when NEMA gets back to all stakeholders we shall have a way forward” She further added. To have the project renamed Bugungu-Tilenga, Ms Adengo explained would call for engagement of the three Kingdoms; Acholi, Alur and Bagungu. She, however, advised against it, saying renaming the project would be reason for the other two tribes to ask that the project takes up their names as well. NEMA ED Dr. Tom Okurut, while closing the hearing informed the gathering that the outcomes of the public review would contribute towards making a final decision of the project in accordance with the environment impact assessment regulations; and assured the stakeholders that all their concerns would be considered and looked into. At the Nwoya public hearing two days later held at Gwotapwoyo Primary School, the controversy of the Tilenga project name was again raised. Local leaders asked that the oil fields be named after the lineage of indigenous chiefs. The leaders also claimed the developers had not undertaken enough Corporate Social Responsibility activities in the Northern part of the project area and urged the developers to consider undertaking similar projects in the north as had been done in the Buliisa area. Robert Steen Omito, the Packwac District Chairperson cautioned against tribalization of the oil projects warning that it would spark off emotions that would lead to armed conflicts. However the State Minister for Mineral development, Peter Lokeris said the argument over the naming of the project should be not become a dividing factor and reminded participants that the project would cease to be once the developments is complete. The Tilenga Project is of interest because stakeholders are afraid that such developments in an ecologically fragile area in Murchison falls national park and around the Nile delta could potentially affect the environment. The national park is one of Uganda’s leading tourism destinations and it hosts thousands of species of animals, birds, insects and reptiles. Other concerns are that River Nile waters are shared by Uganda, Rwanda, Sudan, Tanzania, Burundi, South Sudan, Ethiopia, Kenya, Egypt and DRC and therefore any form of pollution in the form of oil spills would likely cause hostility from other countries that share the resource.